Meet the tech team from 15th Club, a UK golf analytics company who helped Europe win the Ryder Cup and are now shaping the careers of golf’s biggest stars like Rory and Matt Wallace. When Ian Poulter and Rory McIlroy were at a quandary as to who should tee off on the odd and even holes in the Ryder Cup foursomes, they sought the advice of 15th Club. Their insight, driven by statistical analysis, helped to shape the team’s strategy and saw them labelled as Thomas Bjorn’s secret weapon in Paris. But none of that would have been possible were it not for their football business, the aptly-named 21st Club, and the intervention of Darren Clarke. During a chance meeting with the soon-to-be Ryder Cup captain in 2015, they showed him how they were using analytics to help Premier League teams contextualise performance. “I’ve got to have this for the Ryder Cup,” was Clarke’s immediate response. 15th Club was born less than a week later, and chosen as the unofficial stats partner for the 2016 European Ryder Cup team. “I was blown away with what 15th Club showed me,” Clarke admitted. They reprised the role again during Bjorn’s tenure where their work behind the scenes influenced everything from the qualification process and captain’s picks to the partnerships and singles order. Managing director Dan Zelezinski is keen to stress that they were simply another voice in the room; it just so happens that what they told Bjorn and the team contributed to America’s second largest defeat in the history of the event. One would imagine it won’t be long before Padraig Harrington comes calling, since they’ve also been changing the way he and every single member of the European Tour practises and prepares. They now work on a consultative basis with more than 40 players, of which at least 75 per cent gained 0.15+ strokes per round within three months of teaming up. That figure may not sound like a lot, but it is when you consider an improvement of 0.25 per round, when compounded over a season, equates to a $600,000 increase in average earnings on Tour. 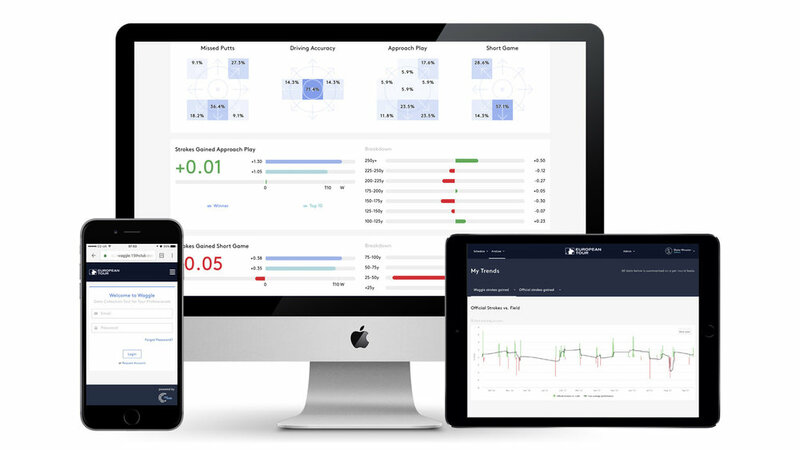 “Our mantra is that we help pro golfers to win by applying intelligence to data,” says Zelezinski. That sort of talk was enough to convince McIlroy to come on board last year, and for us to call their head office in Hatton Garden to find out how they practice what they preach. The 2016 Ryder Cup became ingrained in the DNA of 15th Club. That opportunity was the driving force behind diversifying 21st Club, our footballing arm, into golf. There was always an appetite to have a multi-sport business, and the Ryder Cup was the original catalyst. There are many layers in terms of our value creation. Ultimately, it comes down to making the most informed decisions which are grounded in analysis. We present trusted information, and we’ve had a contract with the European Tour since 2017 so every single member has access to our proprietary software called Waggle. We have different versions which offer different levels of insight. The players didn’t turn up at the Ryder Cup in Paris having never seen our work before. There was almost two years of history and relationships we had built. Indeed, some players on the European team are customers of ours. That was a crucial element. It wasn’t just a fleeting solution for a small window of time. It’s something that’s ingrained in the Tour, and a lot of the work of swing coaches and players is grounded in the data and insights we are providing. Prior to our intervention in 2016, there was no shot-by-shot information provided on the European Tour. It just wasn’t collected. In America, they have ShotLink and around 100 people, including volunteers, out on the golf course with GPS, lasers and cameras. Mark Broadie’s work on strokes gained was made possible by that data being collected, but that’s specific to the PGA Tour. As part of our contract with the European Tour, they have a group of people who are responsible for capturing the information week in, week out. We get access to it which feeds our global golf database and allows a bunch of smart analysts to build our algorithms and models from that data set. Our head of golf, Duncan Carey, is frequently at events on the ground, supporting our customer base. Some relationships are driven by a coach or a caddie, so there’s lots of other stakeholders who are equally interested in having access to our data to refine scheduling or practice, and trying to eliminate any blind spots. There is an appetite to work with players across other tours. We do work with existing players on the PGA Tour, but there’s certainly scope to grow. We are also looking at ways to expand into new markets. In addition to the player business, we are doing a growing amount of work around leveraging our database and our analytics engine so we can help broadcasters and sponsors tell better stories in golf. We currently work with Sky Golf and most of the stats presented by Nick Dougherty in the Sky cart actually come from us. Waggle arms the world’s best players, their caddies and support staff with a unique perspective of their game, revealing the true drivers (or blockers) of performance. Waggle Lite is available to any member of the European Tour and has been since 2017. The players are able to access strokes gained information against the field, identifying the top three and bottom three strokes in a round as well as their traditional stats. A more advanced option called Waggle Elite lets players engage with more enhanced statistics and deeper personalisation, allowing easily identifiable trends and patterns across multiple tournaments. These actionable insights can help shape a player’s practice schedule and course management. For those wishing to subscribe to Waggle Insight, our most granular solution, they get access to performance insights from our analysts, disseminating critical aspects of their game. We conduct performance reviews, facilitate gap analysis, optimise schedules and work closely with swing, putting, mind and physical coaches to interrogate the data, revealing strengths and highlighting blind spots to better shape interventions and significantly improve chances of success. Duncan: We worked with Darren Clarke from April 2015, and I worked closely with him during the whole Ryder Cup process at Hazeltine, of which Thomas was a vice captain. He was party to the information we gave to Darren in the lead up to, and during the event. Off the back of that, I built up a decent relationship with Thomas and when he was named captain in December 2016, we spoke and he asked us to help him. The first job we had was to restructure the qualifying process. We played quite an integral part in that, looking at changing the weight of points after Wentworth and the number of wildcards available to Thomas. He wanted a way to make sure that the players who were in form leading up to the event had a better chance to qualify. Dylan: Had we stuck to the old qualification procedure, Ian Poulter would have made it in and I think Thorbjorn Olesen would have missed out. We actually did some projections and pre Italian Open, Olesen was one per cent to make the team. That was one of the things that displayed the benefit of weighting the form. His performances in the summer of 2018 got him in the team, but in the previous system he wouldn’t have made it. Duncan: I think you will see the new qualification procedure in place for a while now, in the hope that the real form players make the team. Numbers over time also show that wildcards tend to perform better than the people that have qualified in the last few spots. In terms of the actual picks, we went back and forth with Thomas, giving our opinion on who should be picked. But it’s important to highlight that we gave a very objective perspective, purely based on numbers and data. We advised Thomas and Darren before him that you need to use the data and put it together with other factors like experience and personality. Dylan: We did a report following the 2018 French Open, outlining the key factors to success around Le Golf National. It explained reasonably well why different players performed well. It was no surprise that driving accuracy and approach play were quite big things, but we also built a model around course fit, which factors in nine different stats and matches players to different courses. That provided us with an estimate as to how well a player fits the course at Le Golf National. Paul Casey was actually the best fit, followed by Henrik Stenson. Poulter and Sergio Garcia were also right up there. Duncan: To his credit, what the data showed wasn’t a million miles away from what Thomas was already thinking regarding pairings and strategy. So, he was clearly very switched on, and very aware of people’s capabilities. We built an app specifically for the Ryder Cup which gave him all the rankings and individual stats for every player. He could login, and was logging in regularly, to get the information he needed after each week. When he first started, there were 70 players listed and ranked according to different areas, from strokes gained: driving and putting to who was best on par 3s and who was the best under pressure. Everything you could think of was on there, and all the players were ranked against each other. Every player was given their own page, which was then updated automatically every time they played. It was a really good bed of information to see who was performing well, and there was also a planning page so Thomas could start thinking about his pairings. Dylan: Measuring how someone performs under pressure is something we’ve been able to do since 2015 or 2016. Basically, it’s a calculation of how they perform under pressure when they’re leading a tournament, in contention to win or trying to make the cut, versus themselves and their normal performance. That kind of information was key when looking at the singles line-up. Our research told us that it would likely come down to matches seven, eight, nine and 10, so it was crucial that Thomas picked the players he knew were going to perform and not get stage fright. Olesen at the time was ranked No.1 for stressful rounds so that was a key decision to put him at nine, and it paid off when he thrashed Jordan Spieth. Duncan: A lot of Thomas’ thinking was based on insight from sports psychologists, and stats and numbers from us. That was probably one of our main areas of input, and it was essential around that golf course to make sure they were. The partnerships were months in the making. For example, Tommy and Frankie were earmarked to play together at least a couple of months before the Ryder Cup. Thomas knew they were good friends and the numbers said they would be great together. That was one pairing that was pretty nailed on, as most of them were. There was never any time in Paris when we were trying to work pairings out. It was a pretty stress-free atmosphere. Dylan: That ties back to the predictions we were making pre-Italian Open. Although Olesen was one per cent, seven of the eight qualifiers were 75 per cent plus. We were able to give Thomas a relative degree of certainty on who was going to be in the team, so he could start planning around that. Duncan: History also states that you need to get all 12 players out on the course on Friday for them to perform better over time. That was one of Thomas’ key guided principles throughout everything we did. There’s a lot of instances in the Ryder Cup where a captain knee jerks after the first session, and changes things up. But fourballs and foursomes are so different that you really need to stick to a pre-prepared plan. The interesting thing was that Tyrrell Hatton and Paul Casey lost their first fourballs match on the last green, giving a point to the Americans, but if you looked at the stats, they actually performed first and third best out of everyone. Without that stats intervention, you might just assume that they had lost and not played very well, but Thomas knew that wasn’t the case and retained full confidence in them. Dylan: If you look at the way Le Golf National sets up, there is a big emphasis on big pressure, second shots. You need a good ball striker, and Sergio is one of the best in the world. As much as people say you can’t just pick experience, it is a factor. Plus, he was still one of the best drivers of the golf ball. His form wasn’t great, but it wasn’t disastrous. He was still ranked in the top 30 in the world. Yes, there were some players who could have been picked ahead of him, purely on form, but they weren’t as suited to the course or plugging gaps in partnerships. Ultimately, the right decision was made. Duncan: We did a lot of work on the ground with the players, helping them decide who was going to play odds and evens in foursomes. Rory and Poulter especially spent a lot of time working that out. We gave them information on how each hole was likely to play, but made a point of highlighting how the approach shot into 15, the tee shot on 16 and approach shot on 17 were all going to be hit by the same person. So, it was crucial that Europe had their ball strikers teeing off on the odds, which was what Rory did in his partnership. One thing that really stood out compared to 2016 was how everyone knew their roles. Jon Rahm played three times and I think most people assumed he would play a lot more. But he knew his role, knew he was playing in the fourballs, and was solely focused on winning those three points. That man management and communication from Thomas empowered the players to get the job done, and was a major factor in us winning the Ryder Cup. Most amateurs think they have a good understanding of their game, but unless you track your shots and can define what your strokes gained are according to different areas, it’s very difficult to get a true vision of what you need to work on. An average pro hits most of their approach shots from 125 to 200 yards. That’s a really key zone for them, but that’s probably very different for most amateurs. So, you need to, A) Know how good you are from each area, and B) Work out your most-commonly hit shots. There’s no point being incredible with your wedges from 50 to 75 yards if you’re only hitting one, on average, every three rounds. The key is to play to your strengths so if your favourite club is a 7-iron and the stats support that, try and leave that yardage when you’re laying up on a par 5. Duncan: We work with about 40 players, including Rory McIlroy, Matt Fitzpatrick, Matt Wallace and Danny Willett. Some are really into the numbers; Matt Fitzpatrick uses them to drive his practice and performance. We also help players decide their schedules for the season, according to which courses they are most suited to. Of course, players are never not going to play the Masters because Augusta doesn’t fit their eye. Around 75 to 80 per cent of the same events are played by all the top players. The real delta is the remaining 25 to 20 per cent; the ones which pad out the schedule. Those are the ones we make recommendations on. Dylan: It’s not quite as simple as recommending that a bomber should play long courses, though. Take Matt Fitzpatrick. He’s a bit of an anomaly because people think he doesn’t hit it long off the tee, therefore he can only play short courses. But he’s actually one of the best players in the world with a long iron in his hands. That’s why we had a discussion with him recently about his numbers and the quality of his wedge game. Some courses leave you with longer, short game shots and some players perform better hitting those than shorter, short game shots. It does make quite a big difference; sometimes between a quarter of/half a stroke either way per round. We can put a number on it, and show a player which courses give them an advantage or disadvantage. Really what we try to do is make the path for the player as easy as possible. We give them all the information so they know what they need to work on and how best to allocate their time. Dan: The next level down from helping with schedules and providing course information is performance reviews. For example, if the objective is to break into the top 10 in the world, we will profile what a top-10 golfer looks like in terms of their driving, approach play and putting. We then dive into those details, compare their statistics and identify any differences. People tend to make big assumptions around form or rely on traditional statistics like greens in regulation or putts per round, but they rarely tell the full story. Dylan: The problem as well is that world rankings are very much a results-based indicator, but don’t really look at true performance. If someone wins a Major by one stroke, they get 100 ranking points and the second-placed guy gets 50 generally. That’s twice the ranking points for a one-shot difference. Whereas, someone could run away with a regular PGA Tour event and win only 50 points. What we do is look at their strokes gained total versus the field and adjust the stats to provide an index value of how good a player is. There are some players who then pop up as being over or underrated. At the minute, Rickie Fowler is rated quite high for us. Duncan: That makes sense because he doesn’t finish first perhaps as often as he should, but his consistency is very good. Tony Finau, Webb Simpson, Tommy Fleetwood and Patrick Cantlay are also similarly underrated. Dylan: Justin Thomas has been pretty vocal about what his goals are, and we really emphasise how important it is to set performance-based, rather than results-based, goals. You could shoot a 65, and someone could beat you with a 64. It’s far better setting goals around performance. It’s about applying intelligence to the numbers. Conceptualise where you want to be: Our Performance Index metric at the end of 2018 judged Thomas as the third best player in the world. He started this year fourth in the world rankings, but our data suggests ranking No.1 across both categories is very achievable for him 12 months from now. Identify the gaps: Thomas is one of the most well-rounded players in the world. At the Masters, US Open, The Open and US PGA Championship last year, he ranked 30th, 3rd, 19th, and 44th respectively for strokes gained (SG) on the PGA Tour. Based on his current level and that of a typical No.1, he needs to improve by about 0.3 SG per round overall in 2019. The most obvious gap between Thomas and other elite players is off the tee. He ranked 12th best in 2018 in terms of driving distance, but only 30th best in SG off the tee. The 11 players longer than him gained, on average, 0.64 strokes off the tee. Put a plan in place: Those 11 players hit about three more fairways or first cuts over 72 holes than Thomas – worth about 0.25 shots per round. That size improvement in SG driving for Thomas would almost entirely account for the 0.3 SG per round needed to close the gap to world No.1. This is where Thomas’ team comes in and can evaluate why he’s coming up short in terms of accuracy. This must be a collaborative process involving everyone in his camp, working to identify whether there are issues to correct and putting in place a plan to improve moving forward.